I have now been in New Zealand for 10 days and have yet had the opportunity to update this blog. I would really like to post more frequently, but with so much to experience and New Zealand's sparse internet access, I have not been sticking with it. So lately, I have been lying in bed at night with my L.E.D. headlamp (thanks Dad!) and attempting to write out my adventures by hand. There is so much to say about my time here so I may have to cut some of it short, but my beautiful corner view of the big city out of this quaint coffee shop will hopefully make it easy to keep working. Once I arrived at the gate in LAX airport, I met up with a few Australearn students who I recognized from Facebook. A group of about five of us sat on the floor near the terminal and shared our fears and excitement. As time slowly passed, more joined the circle and by boarding time, we had expanded into a group of 15 who dominated the floor of the terminal. We all split up to board the plane and when I arrived at my seat, I was so pleased to find out I had three chairs all to myself. After a surprisingly delicious airplane dinner, I played a movie on one of my three personal screens and made a comfy bed out of my three pillows and three blankets and soundly slept the first half of the trip. I woke up and finished a book I had started in The States: Do Travel Writers Go to Hell? It is a vulgar story about a Lonely Planet guidebook writer's adventure during a trip to Brazil. As a journalism student going abroad, it was the perfect read to spark my enthusiasm about the trip. This day never existed for me. I completely bypassed it to arrive in Auckland on the 7th. How crazy is that?? We arrived at the airport at about 6 a.m. and met our Australearn group leaders and some more students bringing our group to a total of 24. We all hopped on a bus and drove about two hours to Rotorua (known to some kiwis as Rotovegas). We stayed in KiwiPaka, a nice hostel popular for backpackers and thrill seekers. After exploring the town and attending a brief orientation, our jet-lag kicked in and put most of us into a deep sleep by 8 o'clock. We awoke this morning to a large, hot breakfast to begin our jam-packed day of excitement. It began with zorbing, an activity that words cannot even describe. Kristin, another Australearn student, and I decided to ride together. So, we put on our bathing suits and hopped into a big, clear plastic ball filled with warm water and rolled down a grassy hill. This was not a delicate ride as we slipped and slid all across the narrow inside of the ball, but needless to say we got to know each other very quickly. When it was over, they dumped us out, soaking wet and freezing but with huge smiles across our faces. 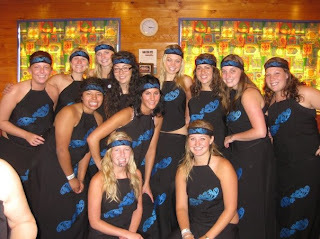 Later that day we returned to our hostel to meet Maori instructors to learn the Haka. The Haka is a traditional Maoria war chant to perform before entering a battle. After much practice, the girls put on long skirts, halter tops and headbands while the boys wore loincloth-esque attire for the final performance. No one held back and we all stomped and screamed and chanted as loud as we could and always finished with a laugh. We're going to an All Black rugby match TOMORROW, so it will be great to see them perform the chant and actually understand what is going on. That evening, we went to the Tamaka Maori Village to learn about the tribal culture and enjoy a traditional Hangi feast. This day was another one filled with New Zealand adventure. We got on the bus that morning and took a short ride down the road to go caving. We each had to choose between a wet or dry cave tour. 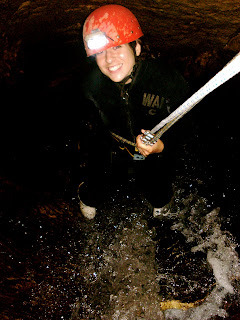 Even though it is Winter here, I could not pass up the opportunity to absail (or repel as it is known in The States) down underground waterfalls. 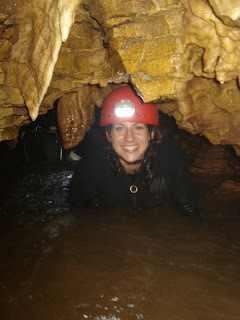 I joined one of the groups that chose the wet option and suited up in a wetsuit, helmet and galoshes (or gumboots as kiwis would say) before trekking to the cave opening. The beginning of the cave was tough and you really had to trust the others in the group to guide you step by step down the dark, tight passages. We were underground for about three and a half hours squeezing through tiny holes and crawling through the streams of water. The best part of the trip was absailing down a 30 foot drop, turning off our headlamps and looking up at a ceiling spotted with green glowworms. The whole experience was unlike anything I have ever done and if I can manage to not spend all of my money by the end of the trip, I may go back to do it again. A few of us suited up and ready to go! During the return drive to Kiwipaka, one of our Australearn orientation leaders surprised us with a stop to see an Angora Rabbit being sheared. This was the biggest bunny I have ever seen and it produced the softest fur. Now that I have seen a rabbit sheared, I have decided that I definitely need to shear a sheep before I leave New Zealand. During our time in Rotorua, everyone was so anxious to get to Auckland where we could unpack and stop living out of our suitcases. Once we finally got on the bus to head there, many of us felt knots in our stomachs and were apprehensive about seeing this new city that we would call home for the next five months. Once we finally arrived, the excitement kicked in again when we saw our flats. All of the Australearn students are spread across the 13 floors of the Wellesley Student Apartments. Each flat has five bedrooms and one bathroom with two toilets and two showers. The five people also share a fully equipped kitchen (with a microwave/oven combo... who even know those existed? ), a common area with a couple couches and a T.V. and a beautiful floor-to-ceiling view of the city. I currently only have one flatmate, Samantha from New York. Although she is from the U.S., she did not come with Australearn. Our other three flatmates are Kiwi girls who have not yet returned from their holiday break, but I am eagerly awaiting their arrival. 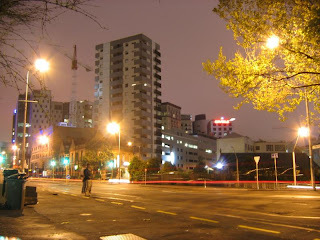 I have been spending my days in Auckland exploring the city and trying to get settled. I like to describe Auckland as the New York City of New Zealand. The streets are always crowded with people from all over the world. I'm glad I am experiencing the city life, but I also cannot wait to get out and travel to the remote parts of NZ. While I would love to continue writing about all of the friends I've made and sights I've seen here in Auckland, I would rather get out of this coffee shop and go experience more! If anyone is reading, please comment to let me know you're out there! hi smels. i see you and coco are still keeping up. glad to know some relationships cant be stopped by miles and miles. looks like you are having fun and i miss you dearly! oh, and i hear brynn got kidnapped recently and taken to the mountains of boone nc. you should look into that. i hear that place is quite the location for sheepherding dogs. Very cool, Kels - love the pictures!!! Sounds like you're having an amazing time.